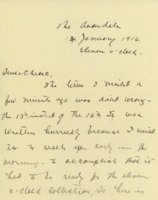 Date is exactly "1916 January 14"
Cary T. Grayson relates anecdotes about his social life in Washington and at the White House to his fiancée, Alice Gertrude Gordon. 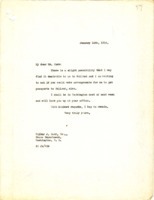 Benjamin Strong Jr. writes Wilbur J. Carr for help in getting a passport to Holland. 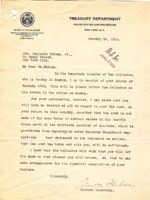 Minton Fluhrer to Benjamin Strong Jr.
Minton Fluhrer writes Benjamin Strong Jr. regard the latter bringing a fur coat into the country.